Since 2008, my daughter Josie and I have participated in a wonderful art project called CHALK. 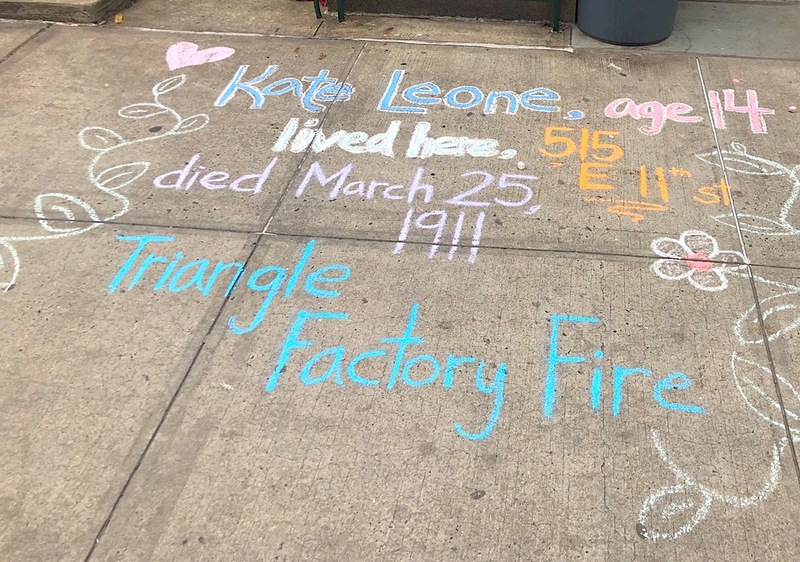 Created by multidisciplinary artist Ruth Sergel, CHALK involves volunteers fanning out across New York City on the anniversary of the Triangle Shirtwaist Factory Fire and writing the names and ages of the 146 victims in front of where they used to live. Sometimes you crouch in front of a tenement that looks a lot like it did back on March 25, 1911. Sometimes you’re on your hands and knees in front of a huge condo or fancy boutique or bank. Since Josie was 7, she’s been writing the name of Kate Leone. 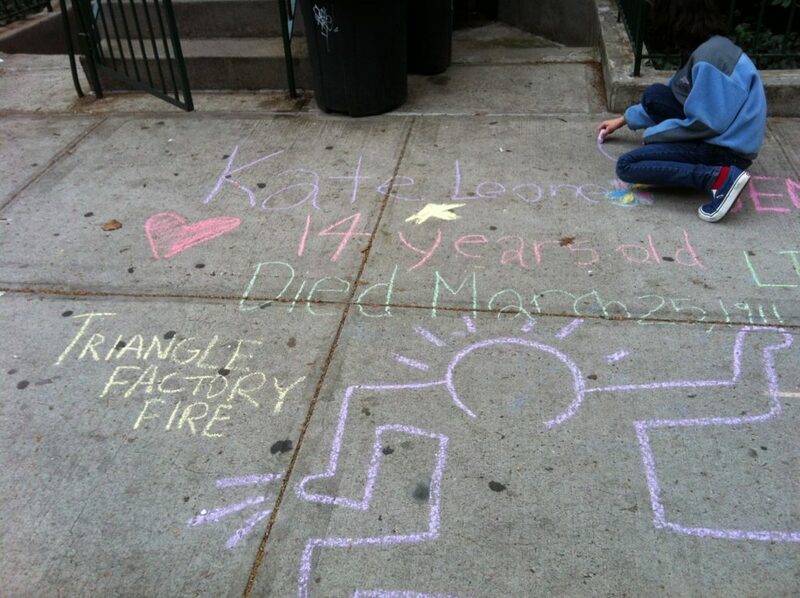 At 14, Kate was one of the two youngest victims. Josie had read two children’s books about the fire and about labor activism in turn-of-the-century NYC: One was called Gotcha, by Carol Matas, about an 11-year-old girl getting involved with the 1909-1910 factory workers’ strike. 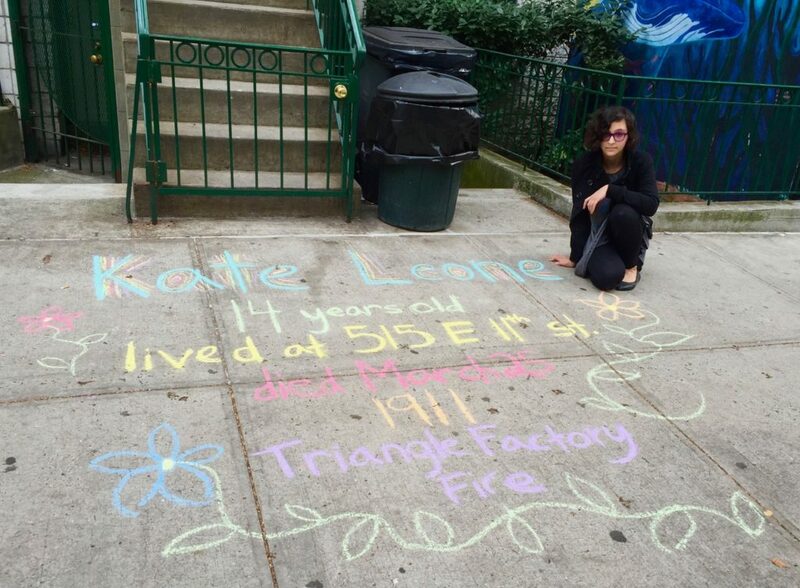 The other was Fire at the Triangle Factory by Holly Littlefield, about two 14-year-old survivors of the disaster. She got a little obsessed, as is our family tradition. I’d always been fascinated by NYC history and its waves of immigration, as well as engaged in the labor movement and with women’s history…all of which come together in the story of the fire. (I’d also found out, belatedly, that my husband is related to Max Steuer, the notorious lawyer who defended the factory owners. I learned this after we named our second child Maxine Steuer. Oops.) 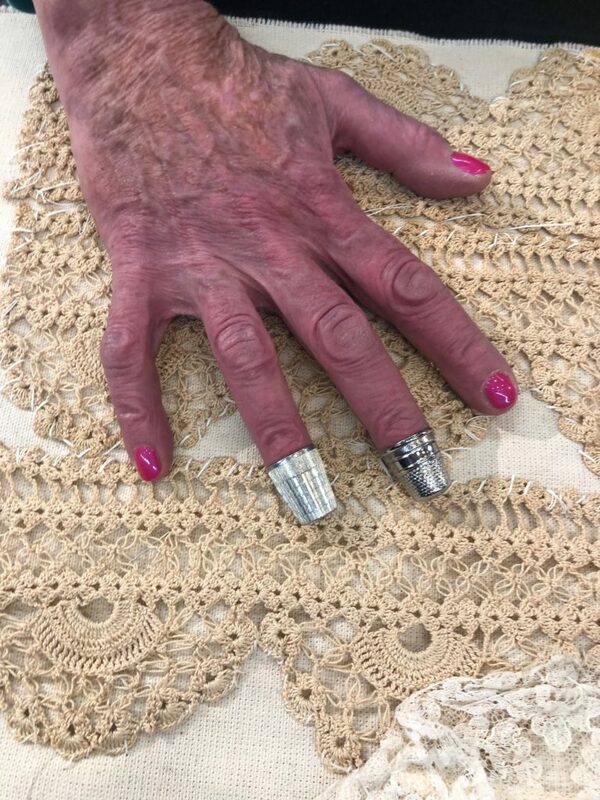 So I was delighted that Josie wanted to be involved in Ruth’s memorial project. 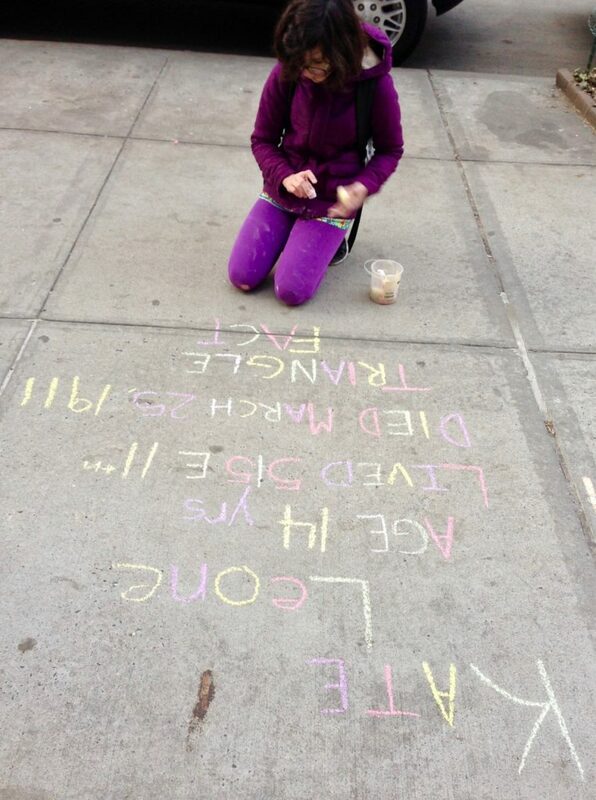 She declared that she wanted to chalk for one of the youngest victims. I don’t remember how we wound up with Kate instead of Rosaria Maltese, also 14; maybe Rosaria had family members who wanted to write her name. 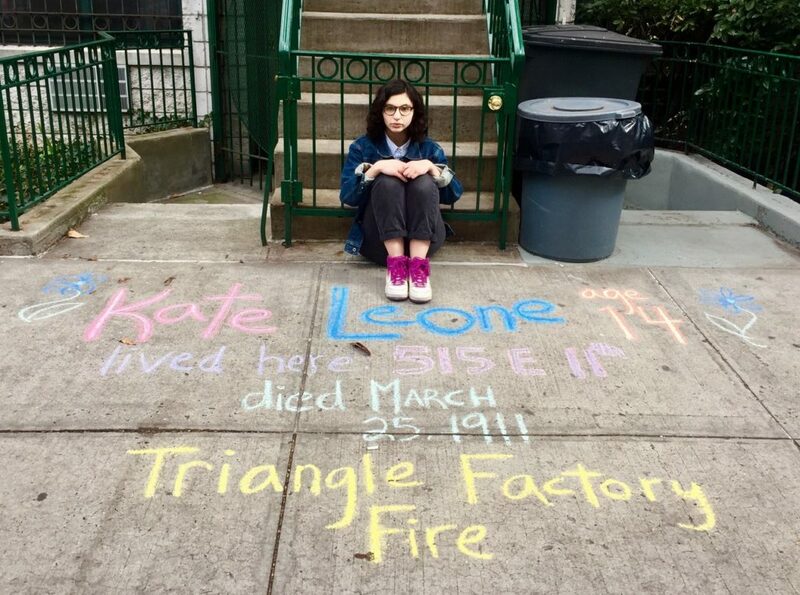 Maltese family descendants have been involved with the Remember the Triangle Fire Coalition. In recent years, as CHALK has become better known, there have been lots of volunteers. Since 2017, we’ve chalked only for Kate. 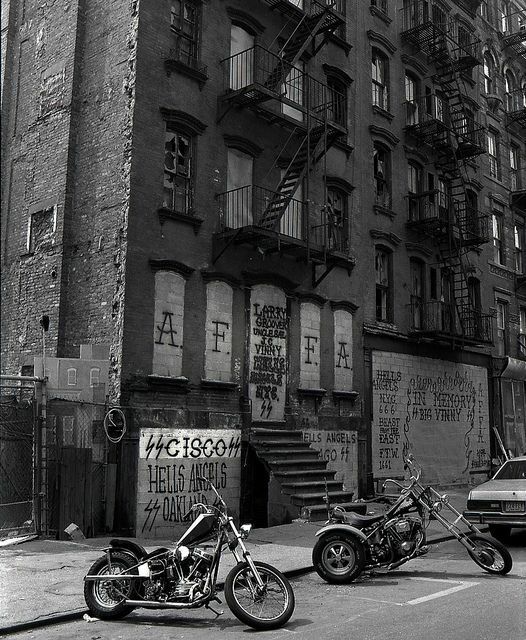 In the early years, though, we walked back and forth all over the East Village, writing name after name. Regardless, there’s something visceral about getting down on your hands and knees on the sidewalk and writing a name, an address, an age, and “LIVED HERE, DIED MARCH 25, 1911, TRIANGLE FACTORY FIRE.” It takes about a half-hour. We put up fliers about the history of the fire and the need for continued vigilance about sweatshops around the world and support for immigrant and refugee rights today. Sometimes there is dog poop. Sometimes people are annoyed that you’re blocking the sidewalk. Sometimes they walk right over your lettering as you’re writing. Sometimes they stop to talk. One year, graffiti artist and Keith Haring collaborator Angel Ortiz passed by and asked what we were doing, then jumped in himself, adding squiggly lines, a radiant baby and a barking dog. Sometimes rain washes the letters away even as we’re writing them. This year, we chatted with one of the current residents at Kate’s address (he said he’d looked up the fire after the first time he’d seen Kate’s name in front of his house, and learned a lot) who’d come outside to empty the trash. 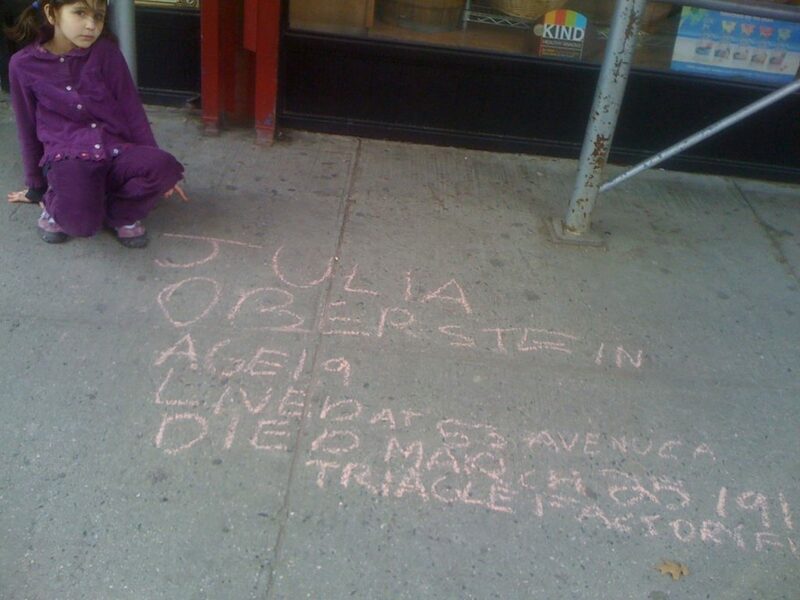 Kate wasn’t the only Triangle victim to live at 515 East 11th Street. Jennie Pildescu, 18, lived there too. Some years when Josie and I arrived with our supplies, Jennie’s name was already there. Sometimes it wasn’t, and we hoped that someone would come later, that she wouldn’t be forgotten. I always imagined Kate and Jennie walking to work together — maybe Jennie got Kate the job? 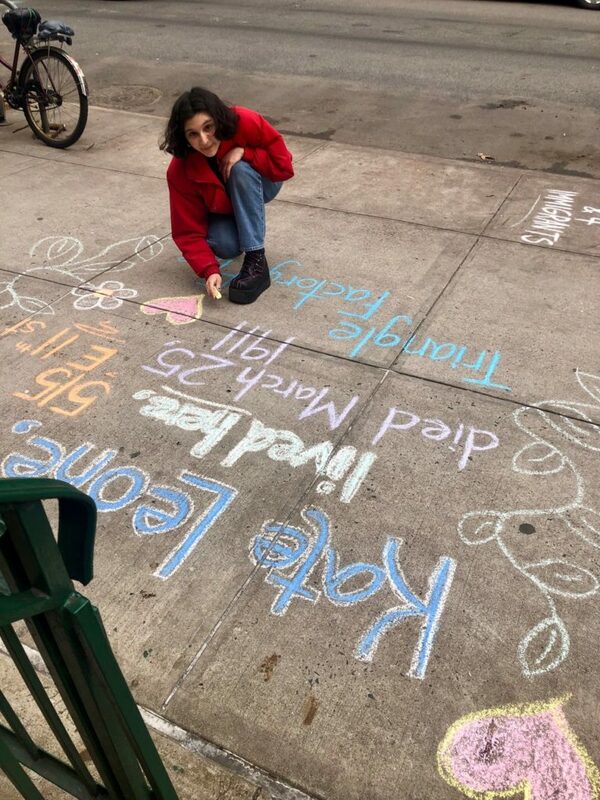 This year, we were surprised and happy to see our friend Vivian pop out of a cab to chalk for Jennie. Vivian’s grandmother was a longtime labor activist who had in fact worked at the Triangle; she wasn’t working the day of the fire. 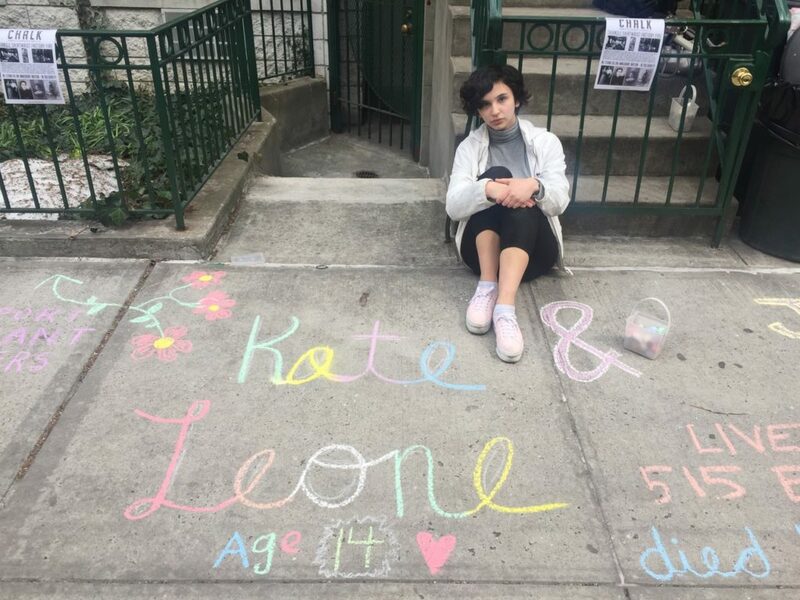 In the tiny world of the East Village, Vivian’s daughter went to public school with my younger kid, and in fact, drew the entire 1st and 2nd grades into neighborhood activism, inducing her classmates to mobilize to protect a local coffee shop and working to save an at-risk school library. Fighting for justice runs in the family. When Josie first chalked she was six. Now she’s 17. Every year she got closer to Kate’s age, then reached it, then passed it. Now she’s headed off to college, to a life Kate couldn’t have imagined. She promises to come back every year on March 25, for Kate. Here’s a picture a year, from 2009 (I didn’t take a picture in 2008! who knew??) to 2019. 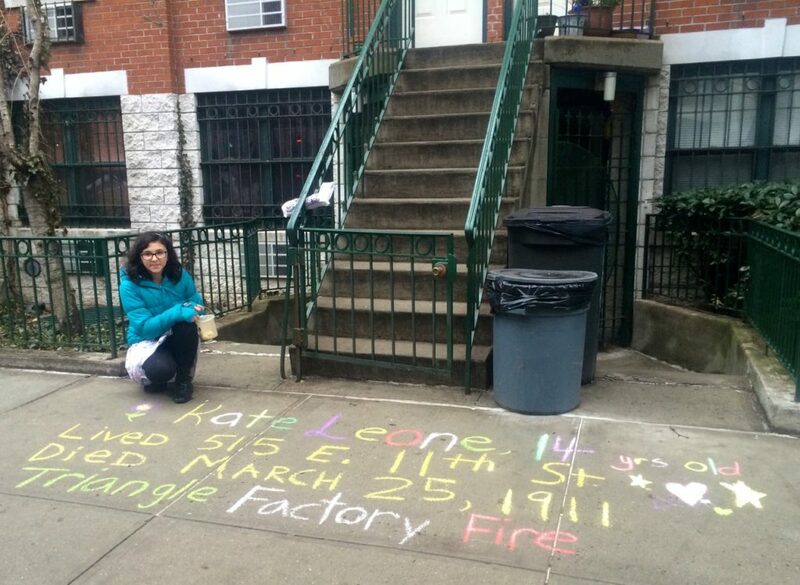 In 2011, someone else wrote Kate’s name before we arrived on East 11th Street, perhaps thinking they were being helpful. We added some designs, then moved on to our other names. 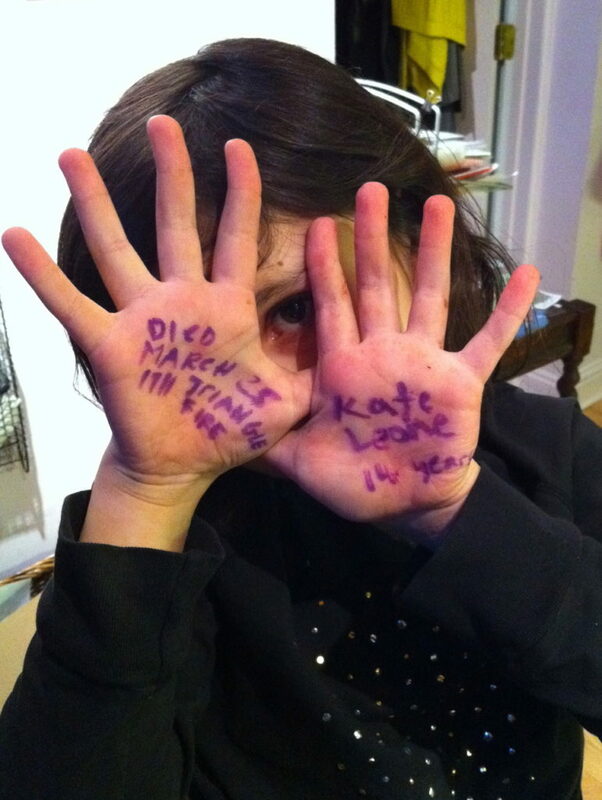 When we got home, Josie wrote Kate’s name on her hand, her own private memorial. 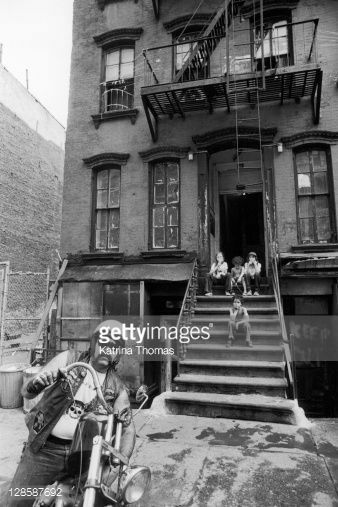 I’m ambivalent about the departure of my longtime East Village neighbors, the Hells Angels. I’ve been on the block for 18 years (chai! ); they’ve been here for around 60 (the history is in the link). 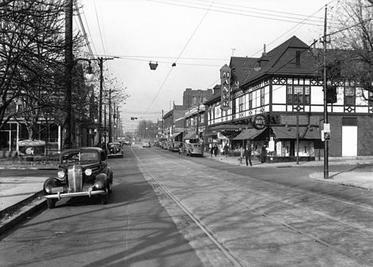 Here are two pics of my actual building — the Angels’ building is across the street — back in the day. It was abandoned sometime in the ’70s or ’80s and became a squat, then the roof started collapsing, then it was sold by the city to a 21-year-old baby proto-developer for a dollar, then the wee Master of the Universe-to-be gradually fixed it up (when we arrived, everything in the back of the building, including the chimney, was painted a hideous seafoam green, because he apparently got a deal on boat paint), and when we moved in it was an interesting mix of artists and creative people and now it is…less so. I’m not sure when either of these pics are from. (Do you?) I do not own them, found ’em online, and will take ’em down if asked. Let’s see. In other news, I raged professionally, like everyone else, about Operation Varsity Blues. Not to brag or anything, but I am proud that cheating is not one of my many, many vices. And I did not raise cheaters. I truly believe everything I wrote in my book about raising kids to be independent, ethical, mensch-y people. THAT IS YOUR JOB AS A PARENT. And if you have a certain amount of privilege, as I do, part of good childrearing is opting out of the crazy-people competitive child-rearing race. My kids went to the diverse, progressive little public school down the block (and to bring this full circle, the original principal just told me on FB that at the beginning of the school’s life — it opened in 1991 — the Angels donated $50 for books every year!) and then to a diverse, non-fancy, progressive, non-testing-oriented middle and high school. These schools have served them really well. My kids aren’t assholes. And they are both curious and clueful about the world. I had dreamed of a child world in which railroads and city streets, farms and factories, the stuff of which the real world is made could be brought down to children’s scale so that they might grasp it. I had envisioned a community of children who could in their own way, through the child activity, which we misguidedly call play, reproduce this world and its functioning. Such a community of little individuals, equals in size and strength and understanding as adults are equals in their own adult communities would learn not only physical truths about the world, but social truths as well, the all-important truths of people with many individual differences who must live and work with each other. 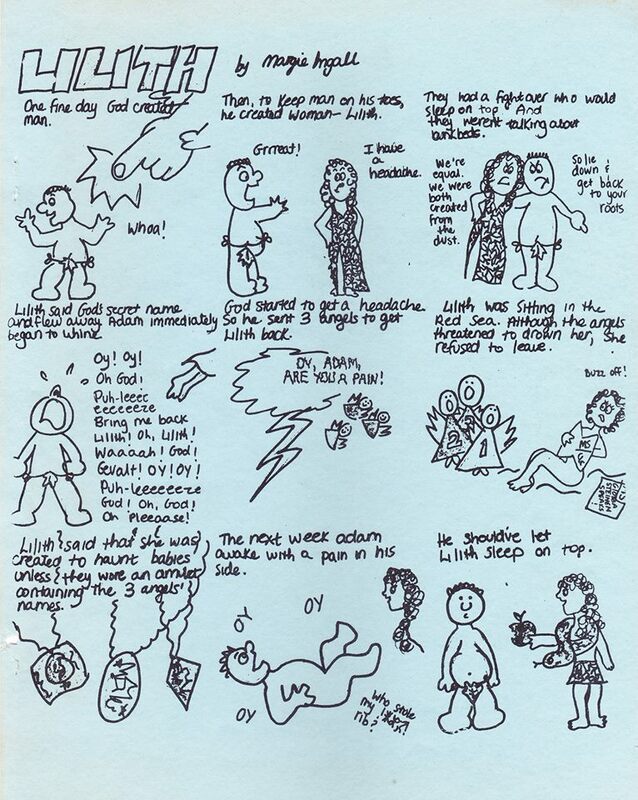 In honor of National Women’s Day, here is a comic I made when I was around 13, about a character in Jewish folklore. Then I grew up and majored in Folklore & Mythology and drinking male tears. 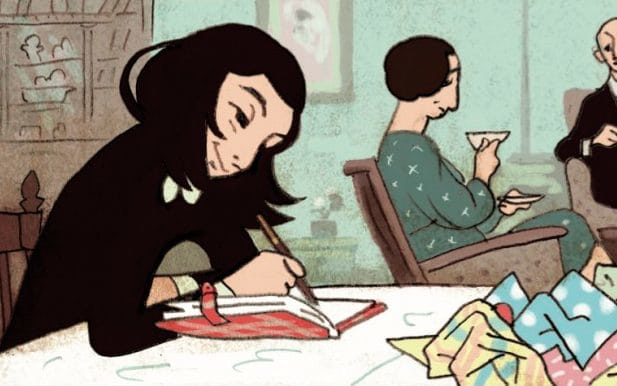 For Tablet this week, I wrote about “sensitivity readers” (terrible name, honestly) and how they’ve become misguided shorthand for OMG CEEEEEENSORSHIIIIIIP IN YOUNG ADULT LITERATUUUUURE. Do I deny that people call other people names on social media? I DO NOT! Do I think we’re giving entirely too much focus to a phenomenon affecting only a handful of books, which distracts us from larger problems in publishing, such as, uh, the paucity of writers getting to tell their own communities’ stories? I DO! Feel free to let me know what you think, though I will ignore you if you’re unpleasant. And: Not all heroes wear capes. Here’s a profile I did for our indispensable East Village NYC blog E.V.Grieve of a friendly neighborhood copy shop man…with a MYSTERIOUS PAST. In non-me news, my friend Fawn Fitter wrote a fascinating piece in the NYT about her plans to donate her corpse to The Body Farm, a criminal justice program. And since I haven’t posted since the Oscars, please let me recommend a children’s book: Ruth and the Green Book, by Calvin Alexander Ramsey, illustrated by Floyd Cooper. It’s about a little girl’s family road trip in the Jim Crow era. It’s completely age-appropriate, scary and realistic but in a way children can handle. The happy ending feels earned — it’s feel-good but in a way supported by history. I read it a couple of years ago and learned a lot, and it suddenly seems more relevant than ever. Ruth is the main character in her own story. Happy 30th birthday, Heather Has Two Mommies! Long time no post. To make up for it, here’s a piece about the 3oth anniversary of Heather Has Two Mommies (I KNOW, RIGHT??) 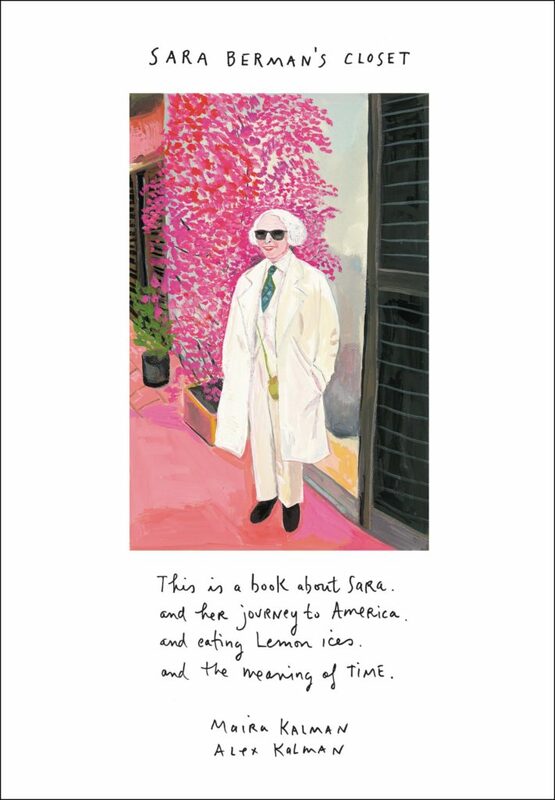 and its prolific author Lesléa Newman’s latest book, a lovely ode to immigration. (Spoiler alert: Newman is for it.) 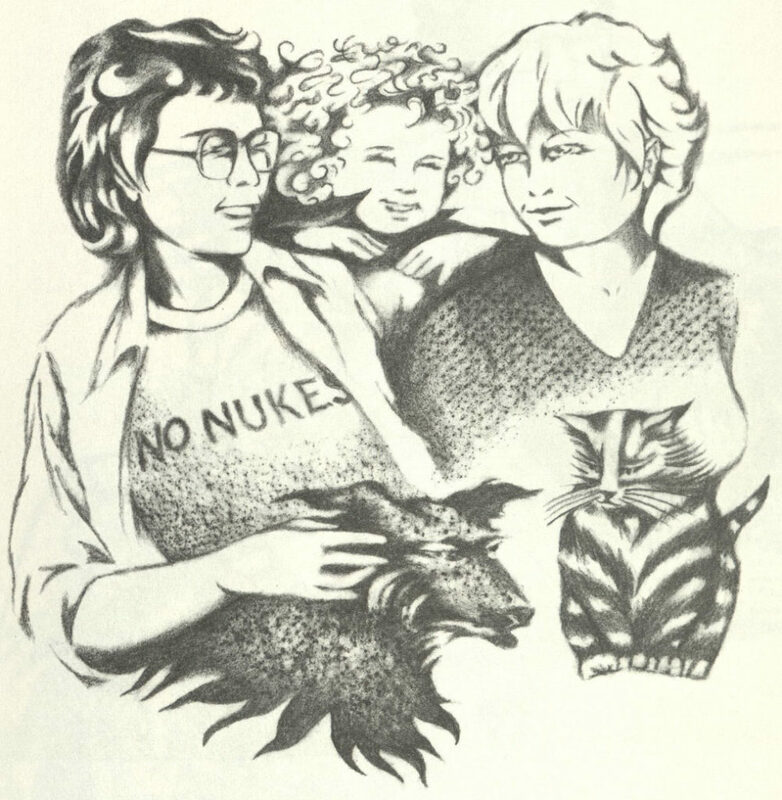 Please enjoy an illustration from the 1989 version of Heather and one from the current version. Further byline roundup: I wrote about a sort of consciousness-raising group for tween and teen boys, aimed at helping them embrace masculinity in an affirming, enlightened, n0n-bullying, non-rapey, non-toxic-in-general way. I found myself disagreeing with some of the ideas and methods, but was hugely impressed with its thoughtfulness…and as someone who identifies as female, I value the notion of men figuring out what works for men. And as ever, we have loads of thrilling and dismaying new apology analysis (a racist crossword puzzle! more racism, from Cindy McCain! bad behavior in DC — shocking, we’re sure — and Brooklyn! and hold the phone, a plethora of ACTUALLY GOOD apologies!) over at SorryWatch. We also appeared on NPR, talking to WNYC’s Amy Walter about the art of the political apology. I just got back from a trip to the UK to speak at the Limmud Festival in Birmingham. Have I ever seen 2500 Jews in one place before? I do not believe so! My own talks went well, and I attended some presentations by other people that were incredible. My three faves (though I enjoyed a panoply) looked at the Sephardic influence on Flamenco, the way the Talmud addresses sexual consent in marriage, and whether or not Virginia Woolf was antisemitic. The three presenters responsible — Leilah Brukhim, a Flamenco dancer who came to Limmud from Madrid; Rahel Berkovits, a lecturer at the Pardes Institute of Jewish Studies in Jerusalem; and Aviva Dautch, a poet, instructor in English Literature at the British Library, and lecturer at the University of London — BLEW MY TINY MIND. So good, so inspiring, so charismatic, all three. I also got to hang with my fam and some wonderful friends in London, and I got to go to the Jane Austen House and Museum in Hampshire (picturesque!) and the Museum of English Rural Life in Reading (possessor of an awesome Twitter!) and both were a delight. 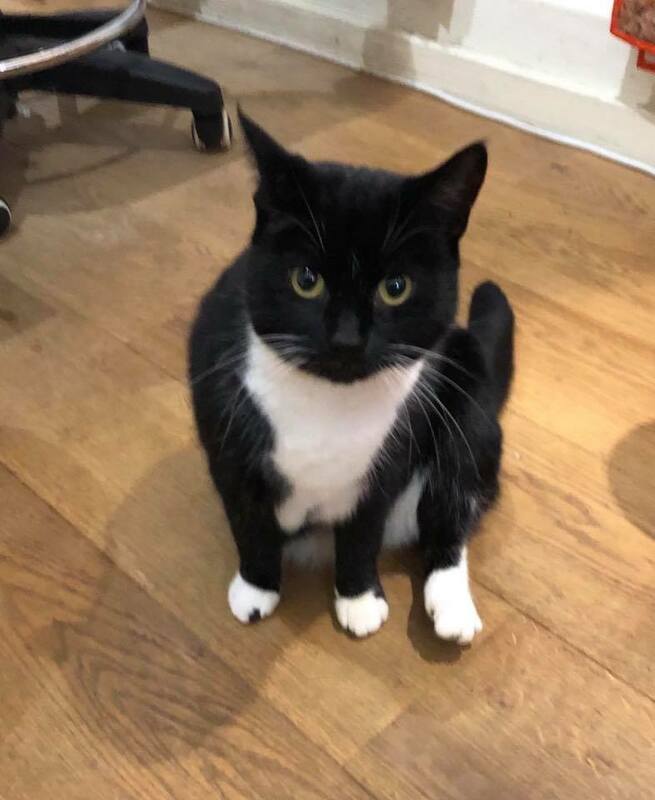 Here is the Jane Austen House cat, Marmite. She bites. Enough about travel. What have I been writing of late? First up: You may have heard that the principal of LaGuardia High School (aka “the Fame school!”) tried to ban swastikas from the school’s production of The Sound of Music. I wrote about how this is a common practice. 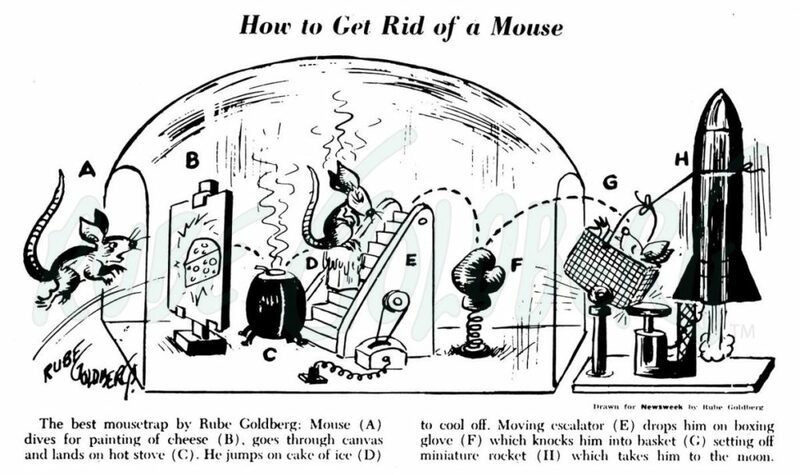 I also visited a fun museum show in Philadelphia about cartoonist/inventor Rube Goldberg. 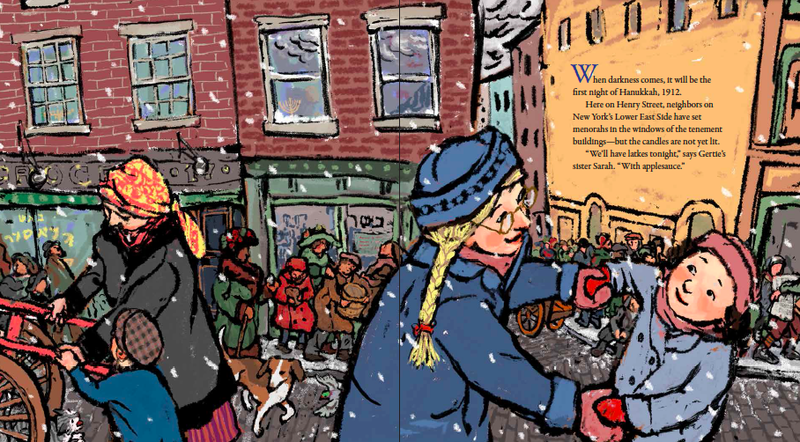 And I wrote about good Christmas books for cranky, FOMO-experiencing Jewish children. May your 2019 be full of joy, comfort, learning, justice, and kindness. …to appear in the WASPiest publication known to humanity! 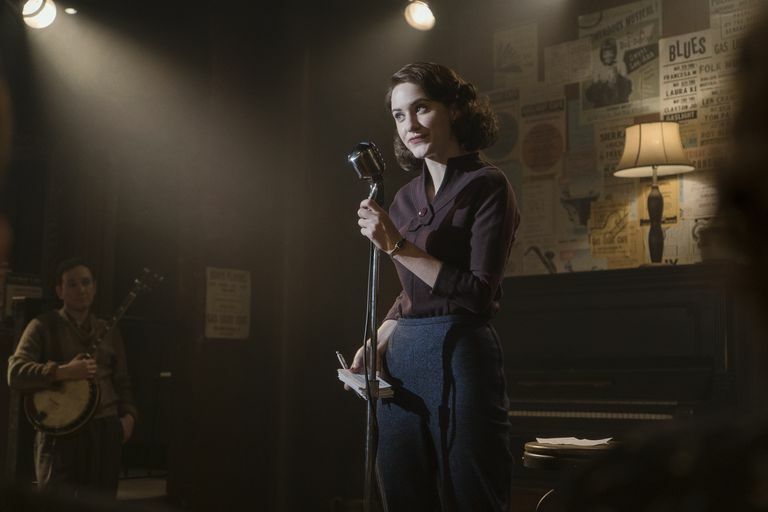 Here I am opining about midcentury Jewishness, feminism, and the upending of Jewish Mother and Jewish American Princess stereotypes in The Marvelous Mrs. Maisel. 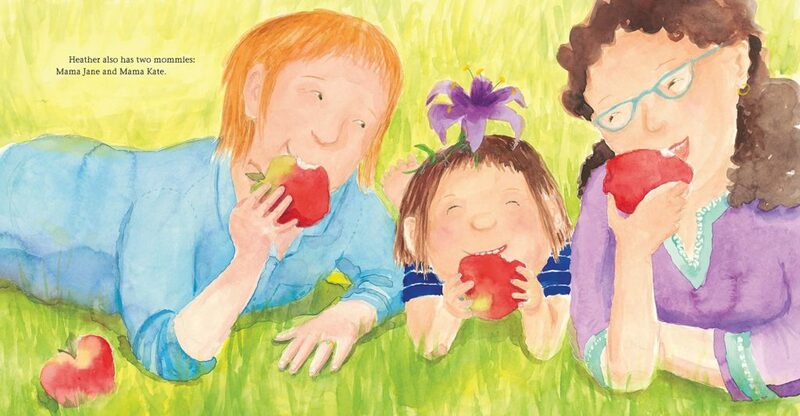 Oops, I forgot to share the The Best Jewish Children’s and Young Adult Books of 2018! Shop quickly? Behold, a very shallow dive into Ruth Bader Ginsburg’s love for scrunchies! In other news, I just got back from the UK, where I was doing book-related events for PJ Library. Fun but exhausting. Speaking of Pittsburgh, I loved this reminiscence about growing up in the Squirrel Hill neighborhood, by African-American Stanford Law professor G. Marcus Cole, and this tribute to Dr. Jerry Rabinowitz, one of the victims of the shooting. Both are beautiful.